Halos around a centre diamond are re-emerging as a popular design feature in engagement jewellery, due to the infinite combinations that truly make your forever piece individual. A halo is a band of smaller gemstones set around a centre stone. These usually consist of micropavé or pavé diamonds, crowning the centre stone in a single or multiple layers. When done well, this highlights and frames the centre stone, without taking away from it’s beauty and makes the overall appearance of the ring bigger and more luxurious. Historically, the halo setting dated back to the early 18th century, where smaller pearls and diamonds were used to circle a central stone. In the Victorian era, the halo style was once again popular, and imitated the shapes of flowers by using pear and triangle cut coloured gemstones such as ruby and sapphire as petals around a centre stone. Despite popular belief, halos do not need to be round in shape, and are not only composed of diamonds. There are absolutely no rules when it comes to what shapes, colours and how many halos are needed in order for you to achieve the engagement ring of your dreams. We have recently adorned a number of unique diamond shapes with halos, and set them in platinum, yellow gold and rose gold. These diamond shapes include emerald, cushion, pear and oval cuts in combination with accents of pink Argyle diamonds and different metal varieties. We also incorporate unusual diamond shapes into the halo itself, such as the perfectly matched pairs of kites and shields that make the above designs truly unique. There is a major point of consideration that should be taken with halo engagement rings when initially deciding on the shape. It involves design considerations for a matching wedding band as bands may not sit flush if the halo is set low against your skin, in which case, you may consider creating a fluid shaped band that curves around the edge of the halo. 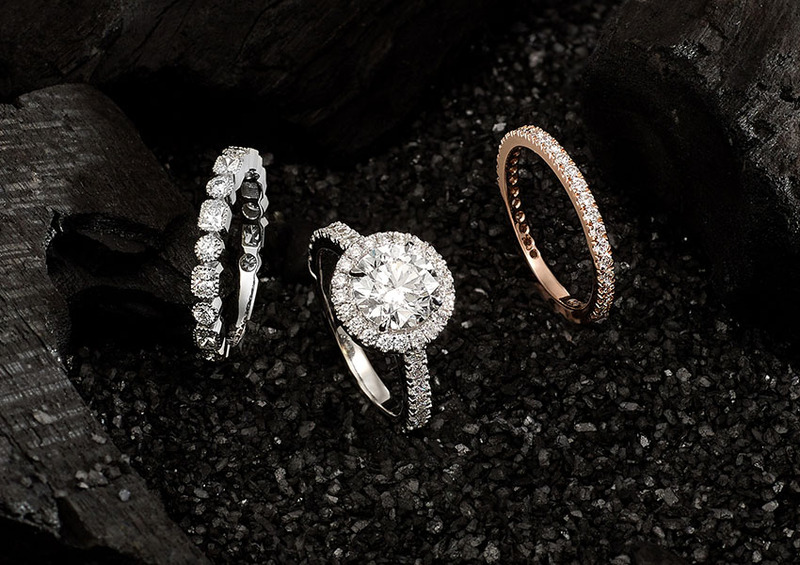 You may also decide on using a metal band in a different toned metal, in order to bring more contrast to your engagement ring whilst playing with the duotone trend. We always like to experiment with some colour in the form of metal tones and coloured stones adds a sense of liveliness and exclusivity. Stones like Sapphires have a wide colour palette, and are second to diamonds in durability. These stones may accentuate your centre stone if you choose to stick with the classic white diamond, or may replace it altogether as an attention grabbing centre piece such as a stunning yellow diamond, or the romantic red of a beautiful big ruby. If you would like to find the ring of your dreams, please book an appointment with us or visit us in our boutique.